Anyone looking for a surge protector that cuts power when it can no longer offer protection should consider this model. 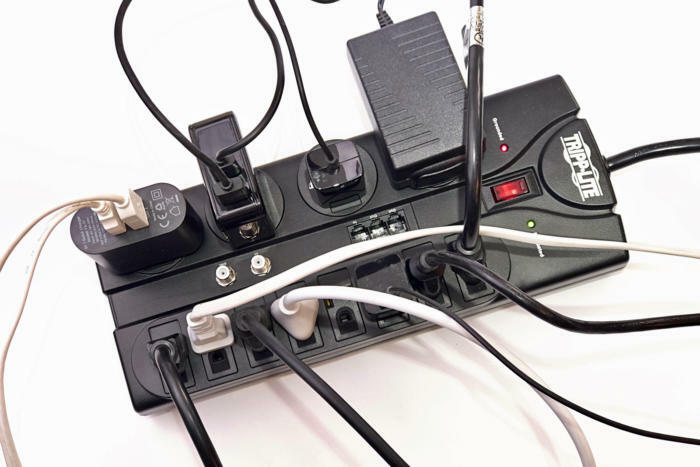 Tripp Lite’s 12-outlet surge protector might lack a product name—model number TLP1208TELTV doesn’t exactly roll off one’s tongue—but it has nearly everything else. It’s your best bet for a surge protector that cuts power when its internal protection is exhausted, and it offers a relatively good outlet layout. If you don't need coax protection, Tripp Lite's TLP1008TEL is the better choice. You want a surge protector that stops letting power flow when the internal protection can’t absorb a surge if you’re in an area or on an electrical system with regular surges or electrical strikes that cause voltage spikes, and you have a high degree of concern that you might experience damage before noticing the Protected light on your surge protector has gone out. If that’s the case and you have hard disk drives (HDDs) on attached computers rather than SSDs, or other hardware that could be damaged or corrupt data if the power is cut off, consider adding an uninterruptible power supply. A UPS comes with a back-up battery that can provide power long enough for you to shut the computer down in an organized fashion. The Tripp Lite TLP1208TELTV features eight outlets with regular spacing in one row, and four more widely spaced ones opposite. The outlet’s plug orientation is all away from the center to make it easier to power AC adapters. In my testing, I was able to plug in 11 different cords, including five power bricks and chargers, but the fit was too snug on the regularly spaced side to drop in a 12th plug. 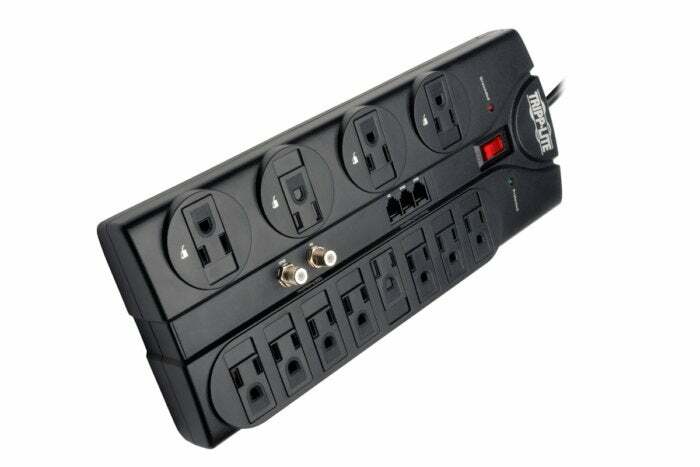 This surge protector features child-resistant outlet covers, which slide over and snap into place on all 12 outlets. Tripp Lite states clearly that this surge protector will stop providing power when its MOVs that offer 330V clamping on the line-ground (L-G) and 400V on the other two legs can no longer block surges. It’s a little odd to put more protection on the L-G leg than line-neutral (L-N), but the difference isn’t so much as to matter, and 400V isn’t out of line. The MOVs will pass more surges through, which extends their lives, too. There’s also a circuit breaker to prevent overloading the outlets, and the power switch has a reset rocker after it trips. As widely spaced as they are on one side, the Tripp Lite TLP1208TELTV can accommodate only a limited number of wall warts. There’s a Protected and Grounded light near the power switch on the surge protector. The former might seem odd, since this power strip should cut power when protection fails. The light may be an additional visual indicator, but Tripp Lite doesn’t explain this discrepancy further. (On a competing unit from APC, protection cuts power only on the L-N leg, which provides electricity to devices, rather than on the grounded legs, which to protect against short circuits.) If the Grounded light isn’t lit, contact an electrician immediately. The Tripp Lite has a flat, 45-degree angle 3-prong plug at its end, making it easier to fit into an outlet behind a desk or cabinet without stressing the cable. This model also includes coaxial and telephone line pass-through protection, which we've found isn’t valuable or reliable on any model. We didn’t test this one and we don’t recommend using it. Tripp Lite offers a $150,000 warranty for damaged equipment for the device’s original owner for the lifetime of the device. It also offers free replacement if the Protected light ever goes out, whether there’s any damage or not. Without trying the replacement process, I don’t know how involved it is, but given the low street price, it will probably cost as much in shipping and your time to return it for replacement as to buy a new one. The Tripp Lite 12-outlet surge protector has outlets spaced just a little too tightly for maximum utility, and it could do with a cord organizer to help keep things neater. But you can’t do better in terms of price and features for a surge protector that cuts the juice when it can’t perform its function any longer.